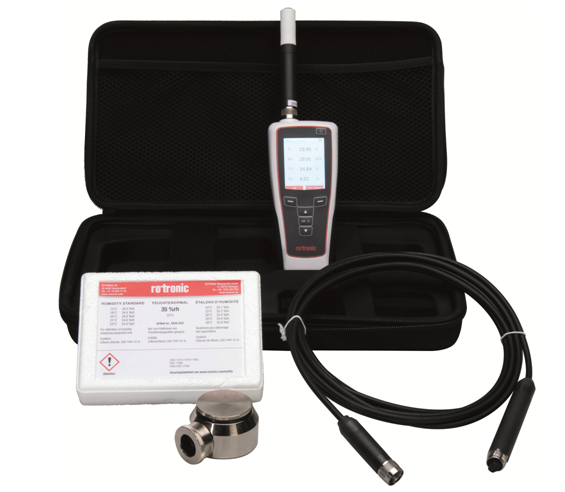 Rotronic, the world-leading Swiss manufacturer of environmental measurement and monitoring equipment, has developed the HygroPalm HP32 as a handy and versatile handheld measurement instrument able to perform on-the-spot spot measurements and logging of relative humidity, temperature and psychrometric parameters. The HP32 is compatible with all Rotronic HC2A and HC2 probes and uses HW4 Software. This combination makes the HP32 capable of performing a wide range of application tasks including: Field inspection and spot checks in HVAC, inspection of Building Management Systems, environmental checks in the Agriculture and Food industries and production and storage environments in the pharmaceutical Industry. 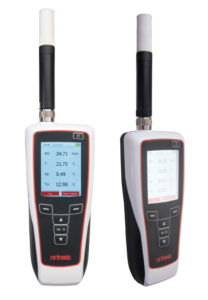 The HP32 allows the user to choose instant displayed values for temperature, relative humidity, dew or frost points, wet bulb temperature, enthalpy, mixing ratios, etc. It is also versatile in use, allowing the user to generate programmable data logs, spot measurements, graph views and visual or audible alarms. The HP32 delivers a clear set of user benefits in being able to take instant and accurate measurements of relative humidity and temperature and make psychrometric calculations. The case form allows the HP32 to be magnet or tripod mounted or worn on belt. The HygroPalm HP32 comes complete with soft case and a Micro-USB cable for PC connection and battery charging. The included HW4 LITE license key allows up to three instruments to be connected to the same computer. Click on Rotronic HygroPalm HP32 handheld spot measurement instrument for more information.